The Snakehead is a character in the 3D Universe who appears as a minor character in Grand Theft Auto: San Andreas (set in 1992). He is the leader of the Da Nang Boys gang in San Fierro. He does speak in his only appearance although his voice actor is not credited. The Snakehead was born in Vietnam and, at unknown times, joined and became the leader of the Da Nang Boys. In the early 1990s he began moving the gang into the United States and in 1992 in San Fierro, although he himself remained out of the city. 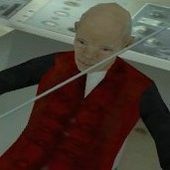 The gang quickly established themselves with ruthless brutality, as evidenced when they destroyed the Blood Feather sect of the San Fierro based Triads. One of the Triad leaders, Wu Zi Mu, later sends his associate Carl Johnson to infiltrate a recently arrived freighter in the harbour, which they believed was full of contraband but was in fact used for human smuggling. Johnson frees the prisoners and, after killing numerous Da Nang Boys gangsters, locates The Snakehead. The Snakehead, armed with a sword, throws Johnson a sword and the two begin to fight each other, with Johnson killing him. Carl Johnson can use any weapon to kill The Snakehead, not just the Katana given to him. "Snakehead" (Chinese: 蛇頭; pinyin: shé tóu) is the Chinese term for gangs involved in smuggling people. The Snakehead's character model can be found at the Cobra Marital Arts Gym, even being voiced by the same person. This page was last modified on 9 November 2013, at 22:11.